Healthwatch is about helping you influence the delivery and design of your local health and social care services. You can speak to Healthwatch about your experience of services. Visit their website here. Patient experience is important to us. It tells us what you think of our services and what makes a difference to you. Your feedback tells us how we are doing, what we are doing well and where we need to improve. You might want to share with us how you felt, or how you were treated, or about the care you received. You might want to comment on the appointment process, how and when you received your appointment, or whether you could park your car when you got to the clinic or hospital. Comment cards – these may be available when you have your appointment. 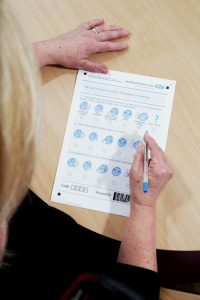 Friends and Family Test – a questionnaire that you complete when you visit your clinic or hospital. Patient stories – an opportunity to give your story to our Trust Board. NHS Choices survey – that is available on NHS Choices website. Care Opinion – an independent site where you can give feedback. Patient Advice and Complaints – for complaints and/or compliments. In September and October 2015 our Patient and Involvement team went on tour travelling around our local communities and visiting some of our top Bradford District Care locations, talking to as many people as possible about their views, opinions and experiences of the Bradford District Care Foundation Trust services. Over 17 sites were visited and over 100 people go on board offering their views. Here’s what you said you liked and how you think we can improve. The patient involvement team took a stand at the event to hear from the young people on two particular topics. For further information on what the young people said about services they had experienced and what their preferred method of contact is when asking for feedback view the feedback evaluation.